I brought this one by mistake – I thought that it was the new collection containing a new Stephen King short story set in the Dark Tower universe. It wasn't but it's still a nice "little" collection of horror stories. 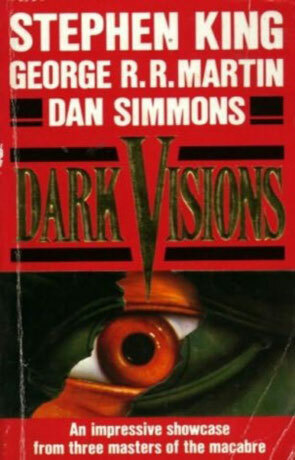 Dark Visions contains seven stories; three by Stephen King, three by Dan Simmons and one (longer) by George R.R. Martin. The three King stories are easily forgotten – none of them gripped me in any way and one of them actually left me cold and disappointed, like no King story has ever done before (Dedication). Luckily the stories by Simmons and the Martin story where very good. The Simmons story Metastasis is actually one of the best horror stories that I've ever read, it was actually horrifying and for the first time that I can remember, a horror story actually entered my dreams (not exactly a nightmare, but it was more a feeling of waking up and thinking "Woah, that was a bit to exciting"). The Martin story is a werewolf story of a modern kind – I've never really been into werewolf stories, but Martin mixed it with an old-fashioned Private Investigator story, which made it quite interesting and entertaining (in a rather ugly way). Stephen King: The Reploids, Sneakers and Dedication. Dan Simmons: Metastasis, Vanni Fucci is Alive and Living in Hell, Iverson's Pits. George R.R. Martin: The Skin Trade. Written on 10th January 2001 by TC.